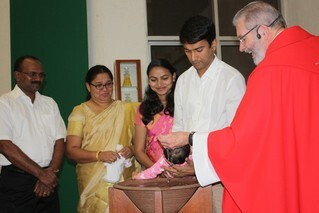 People are encouraged to celebrate the Baptism of their child(ren) with their local Parish. In our Parish we celebrate Baptisms on the 3rd Sunday of each month at 10.30am (EXCEPT during LENT). Parents are asked to complete some preparation beforehand (please ring the parish first to book in). We ask that you book your child’s baptism in plenty of time, as we are often booked out for months ahead. email to stafford@bne.catholic.net.au to ascertain available dates. Comprehensive information about baptism at Our Lady Queen of Apostles Church is available in the parish's Baptism Booklet. The Baptism Application Form is found here - click here to download.